Once a tortoise lived near a pond in a forest. One day he met a pair of geese who had come to drink water from the pond. "Hello", said the tortoise. "It is a beautiful day. Too good to sit inside the house. Where do you live?" "Not far from here" replied Shanti, one of the geese. "We often come to drink water, but we have never seen you before." "I usually stay indoors," replied the tortoise. He and the geese became friends and started meeting every day. The tortoise would come out of the pond and the three would spend a long time wandering around the forest happily talking and gossiping. Not long after, there was a famine and the trees in the forest died as the rivers and ponds dried up. Many birds and animals died because there was no water available. Those that lived in the forest started looking for somewhere else to live. Even the geese decided to leave for a better place. Before leaving, they came to the tortoise and said, "We have decided to go away from this dry forest before we also die. We have come to say goodbye to you and wish you all the best." "So you are leaving me to face my death?" cried the tortoise. "What kind of friends of you? I am so frightened living here alone and facing this deadly environment. Take me with you," he pleaded. "How can we take you with us?" Shanti replied. "You cannot fly. We do not wish to leave you here to face death, but we don't know how to take you with us." "I know I can't fly," the tortoise said with tears in his eyes. "But you can help me. I can tell you how, if you are willing to take me along." "How?" the geese asked. "We will take you if we can." "All right then," said the tortoise with a sign of relief. "Get a strong stick and hold it on either side with your beaks. I can hold onto the middle, with my mouth. Then you can fly carrying me along." Shanti and her partner immediately accepted the proposal and set out to find a suitable pond for the tortoise's new home. Once they found one, they returned to the tortoise with a large stick. "Now that is a good strong stick," said the tortoise. "Let us start our journey. This place is becoming a bit too dry." "All right, let us start our journey," replied Shanti. "But first, remember that you must not speak at all. If you open your mouth, you will fall. So remember to stay quiet throughout the journey." 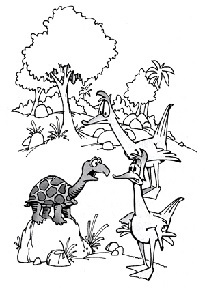 "I am not a fool," replied the tortoise. "I know what could happen." "Well then, let us go," Shanti said. "I want to take you with us to our beautiful pond where we know you are going to be happy, and we can live the way did in the forest. We don't want to lose you." They began their journey towards their new home. The tortoise was taken up with the sights he saw along the way, and very often he felt like saying something about them. But he remembered Shanti's advice. Soon they were flying over a large city, where there were a lot of people. Suddenly they saw a crowd clapping hands and pointing to them, saying, "Look, look there! The geese are carrying away a foolish tortoise." The tortoise became very angry. He could not bear it any more and opened his mouth to tell the crowd off. He fell right into the middle of the crowd and died. "What a foolish tortoise," laughed one of the crowd. "Did he think he could fly by himself?" 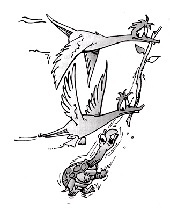 The others joined him in making fun of the tortoise's stupidity, while the geese cried for their loss. They were sad and their hearts were filled with pain. "Our poor friend," cried Shanti. "He did not understand that real happiness comes from keeping quiet."